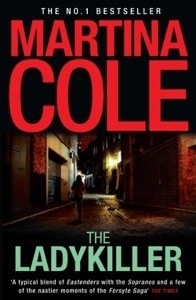 Last week I was watching a programme about crime novels on ITV3 and a guest who frequently appears on these types of shows is the crime writer Martina Cole. Cole specialises in quite gritty east end style crime thrillers and despite looking at the covers occasionally and thinking ‘that sounds interesting’ I have never actually read one of her books. Therefore, by the magic of the Kindle, I purchased The Ladykiller for 99p and settled myself down for a murder spree. George is a quiet, meek and mild man in his 50s, suppressed by his overbearing wife and plodding along in a dead end job he appears to loathe. He comes across as boringly ordinary man, until one night he goes out, hides in the woods and brutally and sadistically rapes and murders a young mother of three. Soon the body count is rising, including the daughter of a local ‘gangsta’ and DI Kate Burrows is under pressure to catch the criminal, preferably before anyone else gets their hands on him. It has been a long time since I have read a crime novel where we already know who the murder is, instead it is just a case of ‘when/if they will be caught’. Despite enjoying the book, I personally prefer the cosy ‘whodunit’ style of Agatha Christie, Dorothy L Sayer et al. I like the challenge of attempting, and nearly always failing, to catch the suspect before the detective does. I did enjoy The Ladykiller and it was a good holiday read, but I did begin to get frustrated after a while. I do not doubt that Cole knows her stuff when it comes to crime novels, but it felt there were just too many separate things going on as well as the crimes themselves. I liked how some chapters looked at George’s childhood and I can see the benefits of dissecting the past to develop an understanding as to why people commit such horrific crimes, but did I really need a psychological profile of some of the minor characters as well? By the end of the novel I was beginning to get equally frustrated with the overuse of similes on what felt like each and every page, so I was glad when I finally reached the end on the plane home on Monday. I completely appreciate why Cole is a best seller in terms of crime fiction, however her style isn’t quite for me, give me a cosy crime read anyday! However it was a fairly easy read for my holiday which I guess is just what I wanted. 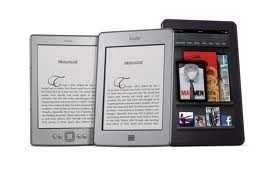 On a separate note, how much do I LOVE my kindle! It took me a long time to warm to Kindles and I did the typical ‘what about real books/bookshops/libraries?’ Style questioning and then I asked for one for Christmas a few years ago. Owning a kindle has certainly not stopped me from buying many books, but it is great when you just get the urge to read a book you don’t own in the middle of night or when you are in one place and your book case is elsewhere. It is also FANTASTIC for holidays! I spent the first part of my half term in Malta with friends and the weather was beautiful, just hot enough to comfortably sunbathe, which is where the Kindle comes in. Malta does not boast many sandy beaches; it is a rocky coastline and sunbathing on rocks is a challenge. However the kindle made this easier as I could just hold it in one hand and comfortably stay in one place on the rock like a lizard basking in the sunshine. And as I flew on a very cheap airline, I could only take hand luggage so the less space used by weighty tomes the better. My trip to Malta has also inspired my current read as part of series one of Game of Thrones is filmed in the city of Mdina. Yes, it is only a tiny part of the series (the gates into King’s Landing and a whore house) but that is beside the point. I feel as though I have been away from my blog for weeks and in truth I have. This does not mean I haven’t been busy reading, I have just been swept away preparing my Year 11s for an early entry exam and all the other hectic little dilemmas that come from a new term at school. I have written a guest review for Dot Scribbles , which I will post once it has appeared on her blog and then, as I wanted to avoid anything too taxing I decided a return to Agatha Christie was in order. I visited Greenway House, Christie’s home in Devon, back in August and I came back loaded with many new crime stories and mysteries to escape into when work inevitably became a tad stressful. Five Little Pigs is part of The Greenway Collection, three books for which Greenway was the inspiration and as I reflect on my reading I am instantly transported back to the lazy, warm summer days of my holiday, strolling, well being pulled around by two enthusiastic dogs, the grounds of Greenway and the surrounding area. Alas I am sat on the sofa, candles lit, watching the heavy raindrops pound the window and the wind twist and turn the leaves of the trees and bushes, what a difference! 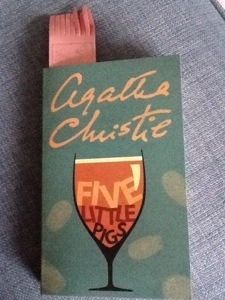 In Five Little Pigs Poirot is called upon to prove the innocence of a woman accused of poisoning her husband sixteen years earlier; unfortunately Caroline Crale died shortly after her trial. Their daughter, Carla, learns of her parents’ fate on her twenty-first birthday and is determined to discover the truth, thus enlisting the help of the most celebrated Belgian detective. And so Poirot begins to piece together the parts of the puzzle; how Amyas Crale was falling in love with a younger woman he was painting; how he was planning to leave his wife and young daughter for this woman and how he was discovered dead on the battery in the grounds of his family home, poisoned when he was so close to completing his masterpiece. On learning of the details of this murder, Poirot soon identifies five possible, living suspects, the five little pigs of the title, thus the mystery commences. How can one not enjoy an Agatha Christie novel? Her writing and characters are so deeply ingrained in modern British culture that it is difficult for me to criticise them. Whenever I pick one up I know I am guaranteed an enjoyable read, full of intrigue, red herrings and a great who dunnit! Five Little Pigs did not disappoint. I particularly liked the narrative style; we were given all the facts in the first section of the book, then each of the five suspects sent Poirot a written account of their memories of that fateful period and then we ended with a typical gathering of the suspects and a great reveal. I couldn’t ask for anything more from a cosy murder mystery. As I have mentioned reading Five Little Pigs evoked memories of my summer holiday in Devon, especially as the murder took place on the battery, a small balcony type feature in the gardens overlooking the river, and this added to my enjoyment when reading this particular Christie novel. 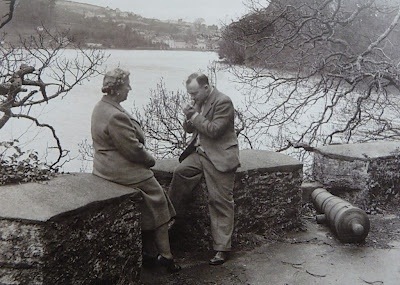 Agatha and her second husband Max on the battery at Greenway. So there has been a murder in the boathouse and one on the battery, I wonder what the third and final book from The greenway Collection has in store. September has been a manic month; with the return of school and the drawing in of Autumnal evenings, I have had little time for chilling out and reading. Usually I enjoy spending my weekends catching up on any work and reading, however all of my September weekends have been just as crazy as the weeks, leaving me with little time for myself. My Classics Club Spin was Charles Dickens’ The Mystery of Edwin Drood and although I started reading it, I have not had much time to sit down and really get in to the book, so I have set it aside for the time being. I am eager to finish it as I hate the idea of giving up on something, but I needed a light hearted read to get me through the next few weeks. Besides it is my birthday at the start of October, so the craziness is set to continue and I need an easy read at times like this. Hopefully I will complete the Dickens soon.